Man, this little engine that could movie is STILL in the top 10 after 4 weeks of release, and since I worked on the film, I’m pretty stoked. Arthur is far gone, Hanna has dropped off the radar, but this little movie about a cute chick who doesn’t look 13 getting her arm bitten off by a real douchebag of a tiger shark is still hanging in there. Competing against muscled juggernauts like Thor and Fast 5 (either of whom could spare her a whole arm without breakin’ a sweat), Bethany Hamilton’s dramatized story about a dickish water cat eating her arm while Hercules and a oddly hot, blonde Jack Nicholson do nothing but scream and tie tourniquets keeps scoring big (well at least enough to keep it in the top 10 in the pre-summer market). Turns out, even though the movie was overseen by the man who brought us Baywatch, this movie that could have simply been “Hot Underage Girls In Bikinis! Guest Starring: Tiger Shark” actually manages to have a heartwarming story that doesn’t belittle women. Anna Sophia’s Bethany is a strong chick, single-minded and driven to return to the sport that defined her as a person her for the sum of her young life. This little chick is the freakin’ T-800 of the Christian Sweet Valley High set; you can rip off her arm, but she’s just gonna crawl her truncated little body through a manufacturing press to get at her Kyle Reese. 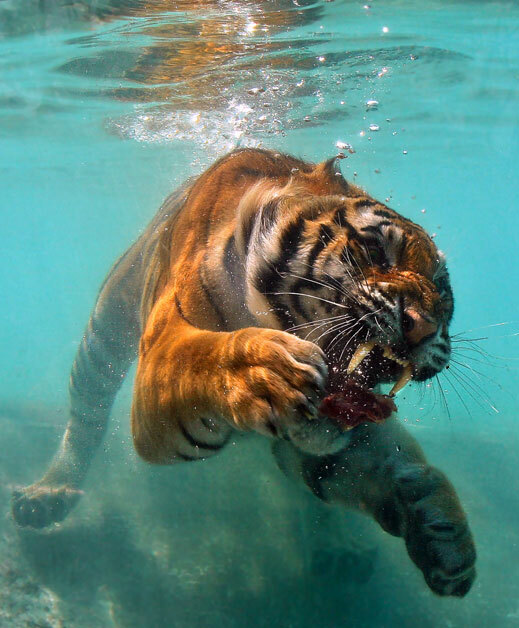 Also, after almost 18 seconds of research I discovered that this is not a tigershark. Not Pictured: Oh screw it, you know. Posted on May 10, 2011, in pop culture, shameless promotion/whoring. Bookmark the permalink. Leave a comment.